Aeonium manriqueorum f. atropurpureum hort. This beautiful species has large heads of deep purple foliage truly stand out against other greenery. 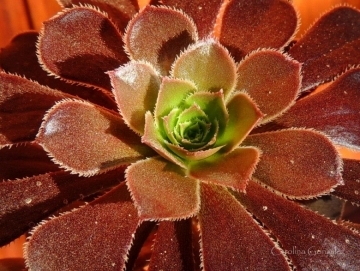 Origin and Habitat: Garden origin (Nursery produced cultivar) For a long time this cultivar has been considered a sport of the Aeonium arboretum. It now seems that it comes from the Canary islands, thus it then cannot be a cultivar of A. arboreum, since A. arboreum doesn't come from there. The latest theory is that it is a cultivar from A. manriqueorum. Aeonium arboreum f. atropurpureum hort. Hist. Nat. Iles Canaries (Phytogr.). i. 185 (1836). Aeonium arboreum atropurpureum f. cristatum hort. Aeonium atropurpureum f. cristatum hort. Aeonium holochrysum Webb & Berthel. Aeonium arboreum var. atropurpureum cv. Schwarzkopf (Zwartkop) hort. Aeonium manriqueorum cv. Schwarzkopf hort. Description: It is a branching succulent shrub that produces magnificent, almost black-purple, leaf rosettes at the ends of its branches. Stem: Forms grey-green beached trunk, spread 25 to 60(-100) cm. Rosettes: Rosettes are formed at the ends of the stems. Flowers: Light yellow flowers that form long clusters. Remarks: The cultivar 'Zwartkop' is a very dark selection of Aeonium arboretum with tall arching stems and large heads of deep purple black foliage. 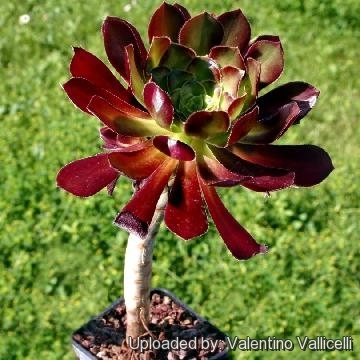 It differs from the common Aeonium arboreum 'Atropurpureum' which has somewhat shorter stems and smaller heads of dark reddish purple foliage. Sometimes it produces nice crested stems and seems to to change in and out of its crested mode during the years. Aeonium arboreum var. albovariegatum (Weston) Boom: is a variety with white margined leaves. It is very similar to Aeonium cv. Sunburst if not the same. Aeonium arboreum var. atropurpureum (W.A. Nicholson) A.Berger: Produces tall arching stems and large heads of deep purple foliage. Aeonium arboreum atropurpureum f. cristatum hort. : Crested form that produces magnificent, fun shaped purple, leaf rosettes at the ends of its branches. Aeonium arboreum var. atropurpureum cv. Schwarzkopf (Zwartkop) hort. : This cultivar produces magnificent, almost black-purple, large leaf rosettes at the ends of its branches. Aeonium arboreum var. luteovariegatum (Weston) Boom: has pale leaves with ample creamy-yellow variegation in the border. Often the leaves at the centre of the rosette are completely creamy-yellow. 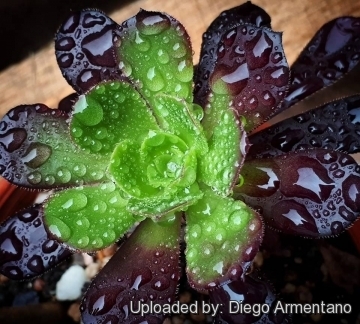 1) Forest & Kim Starr “Aeonium sp. (Aeonium)”. Plants of Hawaii. <http://www.starrenvironmental.com>. Web. 27 Sep. 2014. 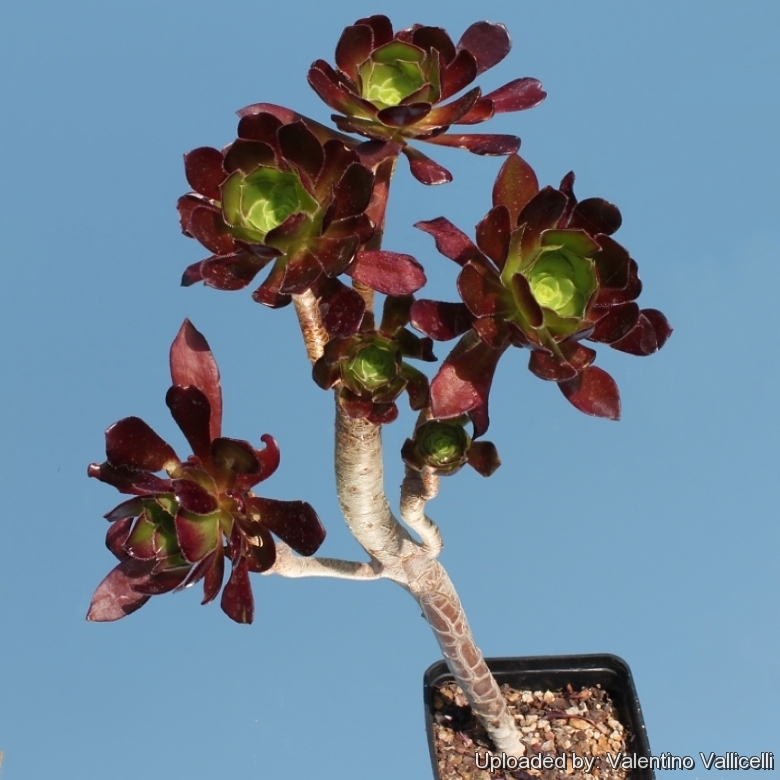 6) Reid V. Moran “Aeonium arboreum var. arboreum (Linnaeus) Webb & Berthelot [family CRASSULACEAE] Flora of North America” Vol 8 Magnoliophyta: Paeoniaceae to Ericaceae. Flora of North America Editorial Committee. 2009. Cultivation and Propagation: It requires gritty well drained potting mix. Water deeply but infrequently. Plants are allowed to thoroughly dry in-between waterings. During the winter months restrict water to about once a month, or just enough to keep the foliage from shrivelling. Position in full to part sun in a sheltered spot, but the bright light enhances the rich hues of the darker Aeoniums, and the subtle blushes of the other colours, but prefers light shade to shade in summer. The plants tend to go dormant in the summer and look a little tired sometimes, but they perk up again in the fall. Summer is the natural dormant season for this species in its native land. Needs protection from severe winter frosts (Hardy to -2°C or a little less for short periods), over winter under glass in all but the mildest of gardens. Use: Aeoniums make excellent summer bedding plants, since their architectural shape contrasts well with most other bedding plants. They can also be used effectively planted in containers.